Geronimo Pole Company produces a large variety of fireplace mantle styles. Our hand-crafted mantles have found their way into all kinds of houses from simple log cabins to finely crafted contemporary homes. Many mantle designs have been suggested from customers, via photographs and preference of wood species. Some customers prefer a smooth refined mantle, while others prefer a more rustic look with deep knots and dramatic character. We do our best to create the appropriate mantles following our customers suggestions. 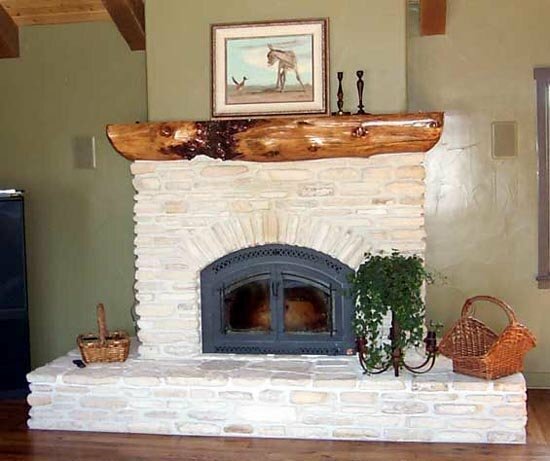 The most common request is for half log mantles with a natural curved bottom. Other customers prefer to have one with a flat top and back and a curved front. Some are also manufactured with corbels installed on the underside. Every creation is a unique one of a kind piece. Prices may vary from $50.00 to $500.00 depending on style type and milling charge. Please call for quote.